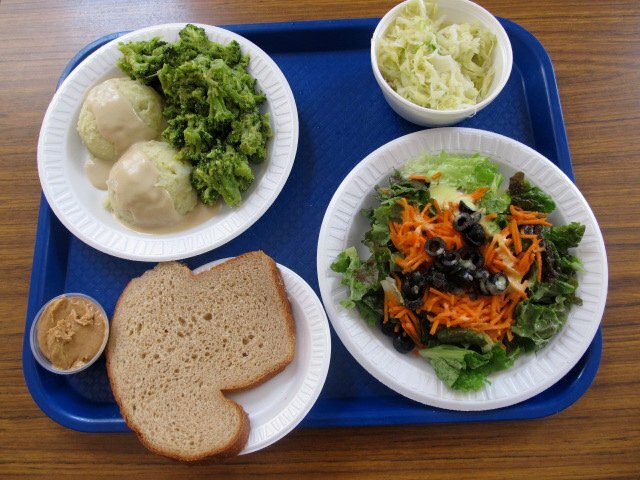 I originally helped make this dish while I was working as a cafeteria manager at my school’s vegan cafeteria. Blend on high until smooth and then cook it while stirring constantly until thickened. I want to thank God for helping us again in the kitchen! Thanks Pureseed Lefhoko for peeling the potatoes and for cutting the cabbage. 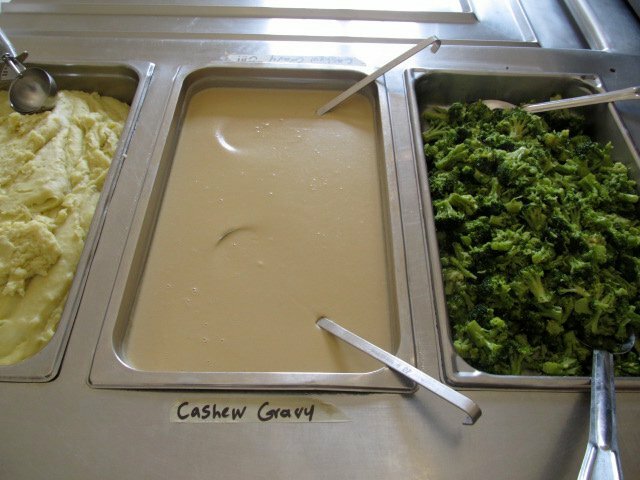 Thanks Vernal Roseval and Dennis Anderson for making the cashew gravy. Thank you Shantavia Gittens for cooking it and for sautéing and seasoning the cabbage. I want to thank a special volunteer for all of her help, and I want to thank my co-worker for making the salad. Also, thanks for the nice whole wheat bread Samuel Francis & Josiah Wold! We peeled them, and then we diced them with our dicing machine. Then we steamed them until the potatoes were soft. I think that took about 20-30 minutes, but I don’t remember because I was in the office working on the final planning I had to do for the weekend. 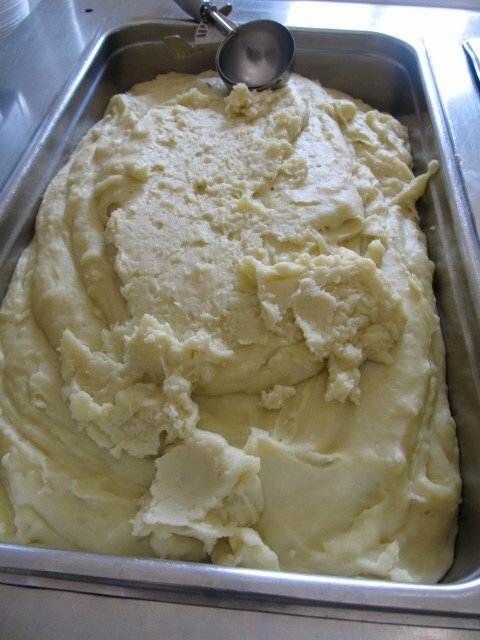 After that, I mashed the potatoes with our industrial bread machine. Then I added olive oil, salt, and our soy margarine to taste. We sauteed it on our grill with olive oil, and we added salt to the cabbage. The cabbage was also in salt water for a day, which added to its flavor, but I don’t believe it’s necessary to make a good sauteed cabbage dish. 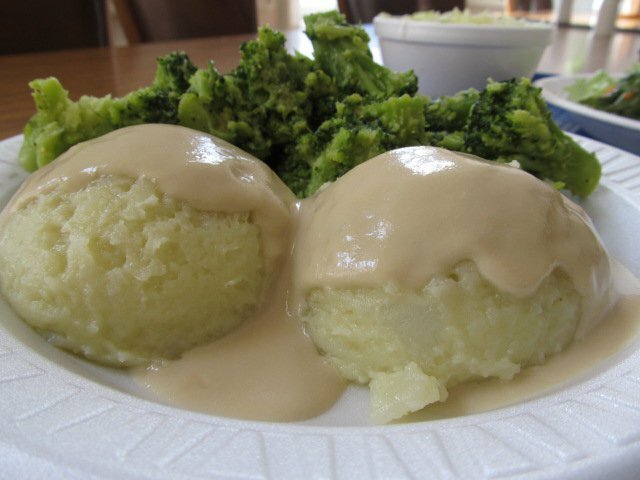 Instead of using almonds for our gravy, we used cashews. Hi, Franklin! Looks great! I’ve been trying my best to find a recipe for homemade hotdogs that you posted on OpenSource Vegan’s Facebook page a while ago. Could you repost it, send a link or the recipe? Thank you! Hello Cosmo638! Wow, that’s bringing back the memories. When I saw everyone eating their Hartdogs, it was truly an amazing experience. I had taken the recipe off of OpenSourceVegan.com. It’s located at Kyong Weathersby’s Facebook profile in her photo album called “A Taste of Heaven”. Look at the top of the list for a hot dog picture, and click it to get the recipe. I’m sorry that it has been a little difficult to navigate through OpenSourceVegan.com. When I started, I didn’t have a camera, and I had a very basic understanding of website design. I still have a lot to learn. Look at the first version of OpenSourceVegan.com: http://opensourcevegan.wordpress.com. LOL! Anyways, the Lord blessed, and I’m categorizing recipes from Facebook here under the blog section. You can the click “blog categories”, which is in the right hand side of the blog section. I hope that makes your future experience better! Thank you so much!! Blessings! excellent idea. We will use this with our almond bisquits and report after we do so.